Omelette with a rice filling. I had no clue what that was and responded back. I could sense Speedy was smiling and she replied with an explanation. Omurice is part of the Yoshoku group of foods in the Japanese cuisine. Introduced during Emperor Meiji’s reign (circa mid to late 1800s) when Japan began adopting foreign dishes, but adding a Japanese sensibility, to their cuisine. Common Yoshoku foods include tonkatsu and korroke. 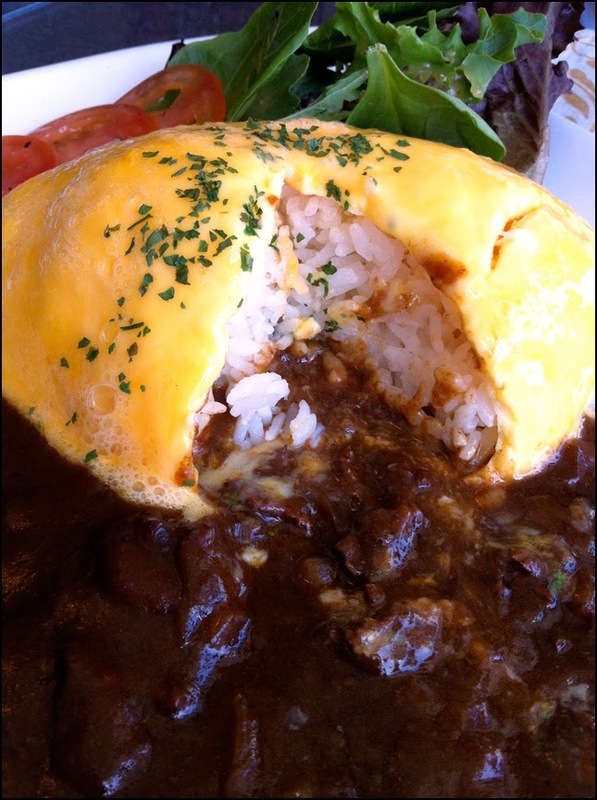 Omurice is the Japanese’s take on the omelet. Instead of filling like mushroom, ham, and cheese, the filling consists of either seasoned or plain rice. It was traditionally served with a simple sauce like tomato or gravy. Speedy’s mom made them for her as a snack and she ate it with ketchup. I was intrigued but I was worried that the only place I could have this dish was at Speedy’s mom’s kitchen. I had never seen the item on any Japanese restaurants I had visited. Even the very traditional Aki’s did not have it on their regular menu. Fortunately, Speedy’s not a tease and directed me towards Marulilu Café. This quaint café is located at the very busy intersection of Cambie and Broadway in Vancouver. The eatery offers a large list of coffee and teas, all day breakfast, sandwiches and a small list of Yoshoku foods. I was not interested in their traditional café fare; I was here for omurice. Marulilu does have a different set up that most eateries. Claim an open table, staff will hand you a menu, and then once you’ve made up your mind head up to the front counter to order and pay. As I perused the Yoskoku section of the menu, to my delight, not only did they have the exact dish that Speedy ate as a kid but additional variations of omurice. I settled on the Omu Hayashi Rice with a mini salad. 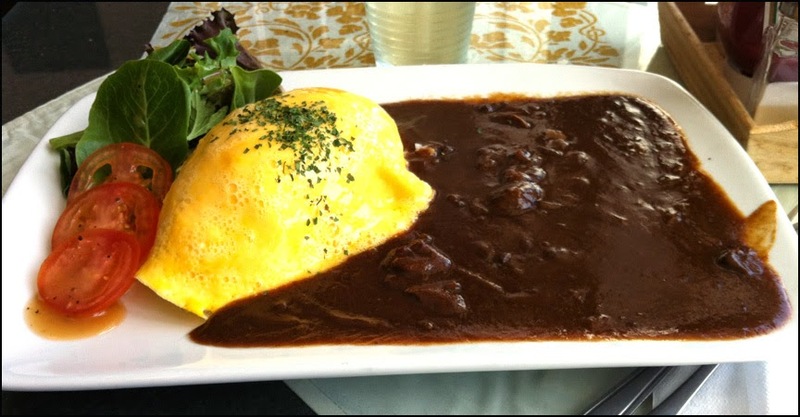 The staff described it as an omurice with a plain rice filling served with a beef sauce. I did not have high expectation for this dish since it was so simple. However, when the dish was set in front of me, I was actually surprised yet pleased with how it looked and the proportion that was given. Despite being a simple dish, it was visually appealing with the glossy yellow omelet set against the sea of deep brown gravy. When I cut into the omurice, exposing the bright white plain rice filling, I realized this was not a traditional offering. The egg layer was not wrapped around the rice filling like an omelet but it was molded onto of the rice. Perhaps a modern take? Undeterred I scooped up the rice, egg and gravy and took a bite. It was tasty and satisfying. I couldn’t stop eating it. The egg was soft but it’s subtle flavour was overwhelmed by the sauce. The gravy had a beefy umami taste and had scraps of beef in it but I not 100% sure it’s made from scratch. It certainly doesn’t have the artificial taste of cafeteria gravy but it didn’t have the deep robust flavour of gravy made from pan drippings either. On Marulilu’s menu they do denote items that are premade/made from a package and I didn’t remember my dish having that explanation on it. Whatever the case, I enjoyed my meal. It was very comforting and filling. Too be honest, one would really have to be incompetent to ruin what essential was rice with gravy. I look forward to trying the other types of omurice on the menu, especially the one variation with served with tomato sauce since tomatoes and eggs are another classic combo (think about it scramble eggs & ketchup, yum). I’m also very interested in trying their curry tonkatsu as a neighbouring table had ordered it and it looked fantastic. I definitely will be returning to Marulilu café for their Yoshoku food.